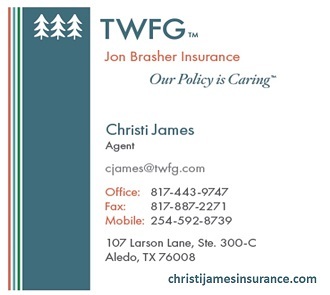 Christi James - TWFG Insurance Services Aledo is located in Aledo, Texas. We offer a full range of insurance products for your home, auto, business and life. 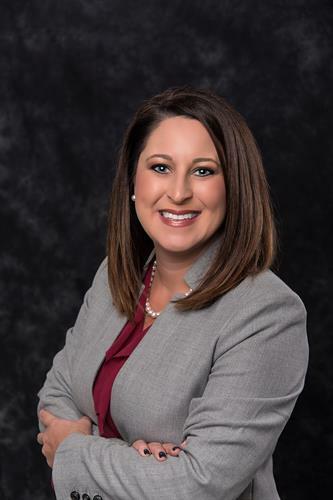 We are a proud member of The Woodlands Financial Group and are ranked #1 in Texas and Louisiana for personal lines privately-owned, independent insurance agencies and #8 nationally (Insurance Journal). At TWFG, our goal is to provide you the best coverage at the best price. We represent multiple insurance companies and can offer you more money saving choices without you spending hours searching for the right one. Whether it's insuring your home, auto, business or life, you need an agent you can trust. I understand you have many options when it comes to choosing an insurance agent and I promise to work hard for you. I pride myself on customer service and take care of each of my clients individually based on their specific needs. From I-20, exit Hwy 1187 and go south for approximately 1.6 miles. We are located directly across from McAnally Intermediate School.